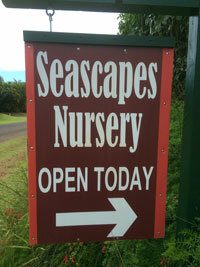 Contact Us - Kauai Seascapes Nursery, Inc.
Kauai Seascapes Nursery is located on the north shore of Kauai, in the town of Kilauea. We are open six days a week, and have on-site parking. For questions, please contact us by phone or email, or better yet just drop by the nursery to speak to one of our knowledgeable staff! If driving from the North (Princeville/Hanalei), take the first right turn off the highway after driving over the Kalihiwai River Bridge. If coming driving in from the East (Kappa/Southshore), we are a few minutes further down the highway from the Kilauea Shell Station and Kilauea Minature Golf. You will turn left towards the mountains at the Kalihiwai Ridge entrance. We are less than 1/2 mile up Kahiliholo Road on the left side. Look for our red & white nursery signs and follow them to the customer parking area. We take all major credit cards, checks, and cash. We deliver plants island-wide on Kauai. Delivery fees are based on distance from our nursery, and range from $50.00-300.00. Unfortunately we are not certified to ship plants out of the State of Hawaii. For purchases to be shipped to neighbor islands in Hawaii, we require a $800.00 minimum purchase. Shipments will be made via Young Brothers, freight collect to Consignee. A $100.00 Plant Quarantine inspection fee and a $25.00 per pallet delivery fee to the Lihue dock is charged in addition to plant orders. We provide plant rental services by the day, week, or month. Fees vary by plant size and variety. Delivery & pick-up services for rental plants is available for an additional fee. Please contact us for more details. We are happy to special grow large quantities or a specific type of plant for you, pending our ability to obtain source material. A 50% prepayment is required on all propagation requests. Volume discounts can apply for large quantity contract grows, please contact us for more details. You may reserve plants with us to pick up at an agreed upon date, and we are happy to hold your plants for up to one month free of charge. However plants held at nursery for longer than a month will be charged a $5 fee per plant per month for care and storage. A 50% prepayment will be requested for large quantity or long hold periods. We offer wholesale pricing and discounts on all nursery stock and products for commercial customers (landscapers, contractors, interior designers, etc.). Must have a registered business and a Hawaii State Excise Tax License to qualify for our wholesale program. Please email Serina at roush@kauaiseascapesnursery.com or stop by the nursery to pick up a Wholesale Customer Application. Additionally commercial customers may apply for a line of credit with us. Please contact the General Manager (Serina Roush-Marchi, roush@kauaiseascapesnursery.com) for more details regarding credit lines. We are happy to offer all non-profit customers a 20% discount on all plants and products. Proof of non-profit status will be requested. Nursery stock returns must be made within 2 business days of purchase. Your receipt is required and returns will be given store credit. Product returns must be made within 7 business days of purchase, and products must be in new condition (not open, no damage). Your receipt is required and returns will be given store credit. Kauai Seascapes Nursery, Inc. gives no warranty; expressed or implied, as to the productivity or performance of any nursery stock or products we sell. Once nursery stock has left nursery grounds, we make no guarantee; expressed or implied, as to its future growing performance.